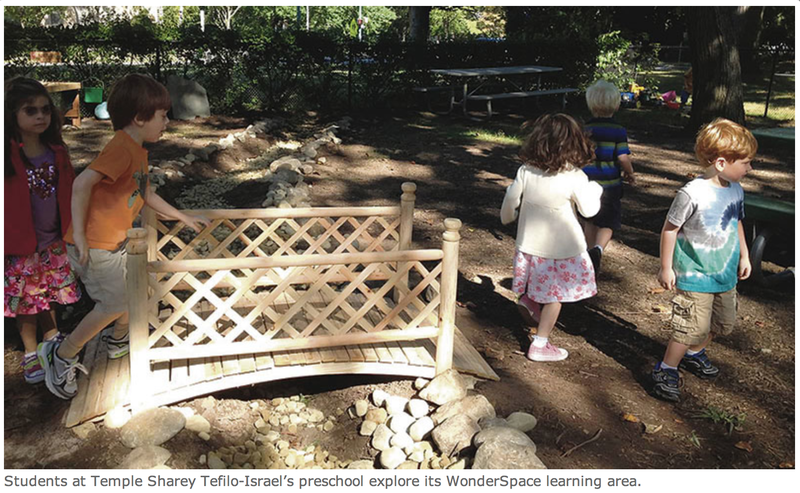 Even for kids accustomed to playing in their suburban backyards, Temple Sharey Tefilo-Israel’s “WonderSpace” is a mind-opener. The outdoor classroom and more offers preschoolers a chance to interact with nature though play, projects, and gardening. And now, a national conservation and education organization agrees. 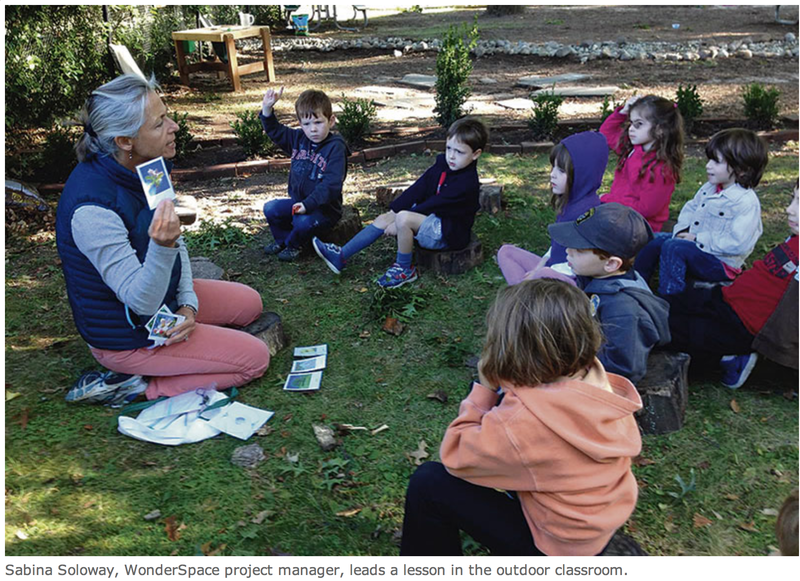 The Arbor Day Foundation, in collaboration with the Dimensions Educational Research Foundation, has certified the WonderSpace a “Nature Explore Classroom.” The certification recognizes programs that demonstrate a commitment to outdoor learning through a well-designed outdoor space, staff development, and family involvement. The South Orange synagogue’s Iris Family Center for Early Childhood Education officially opened the WonderSpace in September. The $20,000 cost was covered by an anonymous donor and with funds raised by parents. Carol Paster, the center’s director, came up with the idea. She had seen an outdoor classroom in Dallas and was determined that Sharey Tefilo-Israel should have one, too. In the space, kids can make art inspired by the nature around them, painting with water on granite slabs, or with regular art materials on easels suspended from a fence. The space includes a little bridge crossing a “stream” of pebbles; there is a jungle gym and other natural and manmade features. There are places to dig, plant, climb, play music, or simply to have lessons outside in the fresh air, sitting on tree stumps. “Anything you do inside, you can do outside,” Miller explained. In the cold weather, parents are advised to send their children to school with warm gear, so the space gets used year round. Sabina Soloway, the nature educator hired by the preschool to facilitate learning, has been planting herbs with the children. Two large wooden barrels stand at the entrance of the space. Every time a class enters the playground, they carefully run their fingers through the herbs and then inhale the tangy citrus scent. 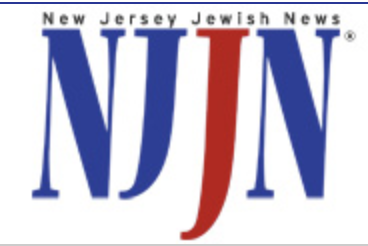 Soloway gathered comments from the children for NJ Jewish News. Jack loves the space because, he said, “I get to plant things and watch them grow.” Ayla said she loves being outside to draw and she likes hearing the wind chimes every time the breeze blows. Miller said the teachers using the space report fewer conflicts and less need to step in to “correct” behavior. This entry was posted in Greening, Iris Family Center for Early Childhood Education, Lifelong Learning, Social Action/Tikkun Olam on February 8, 2013 by danielmcohen. SOUTH ORANGE, N.J., April 24, 2012 – Temple Sharey Tefilo-Israel (TSTI) had a special reason to celebrate Earth Day and more this year. TSTI recently became the first reform synagogue in the U.S. to attain certification for environmental leadership from GreenFaith, a nationally recognized interfaith environmental coalition. The temple, located at 432 Scotland Rd. in South Orange, N.J., was named a GreenFaith Sanctuary after completing a comprehensive program of education, action and advocacy. Two years ago, temple members Phil and Sue Hoch listened to TSTI’s Rabbi Daniel Cohen give a high holy day sermon on Jewish environmentalism, which inspired the Elizabeth, N.J., couple to spearhead the certification process. Over the course of their two-year journey, the Hochs’ efforts and enthusiasm motivated the entire community of temple members and convinced even the most skeptic congregants to get involved. GreenFaith will recognize the congregation for their achievements at a graduation ceremony on May 16. TSTI’s clergy and congregation have participated in eco-themed worship services, religious education classes on the environment, and interfaith and intergenerational activities. They worked together to “green” their own facility, implementing changes in waste reduction, product choices, and energy conservation that resulted in 20% energy savings. In addition, they learned about environmental justice issues and participated in environmental advocacy initiatives. A member of The Union for Reform Judaism (URJ), TSTI was part of a URJ pilot program to help synagogues initiate and achieve certification. “We are proud to have been certified a GreenFaith Sanctuary,” said Phil Hoch. “Environmental awareness is now woven into all of our programs and activities. We will continue to expand our environmental efforts as a result of the education and guidance that GreenFaith provided.” Those continued efforts include environmental field trips for both the preschool and religious school, and “green”-themed Adult Education programs. GreenFaith was founded in 1992 to inspire, educate and mobilize people of diverse religious backgrounds for environmental leadership. As part of its certification program, faith communities across the nation, including Christian, Jewish, Islamic, Buddhist and Hindu groups, are making changes to their worship, education, facilities and social outreach efforts. These involve taking a number of specific steps in the program’s action areas of Justice, Stewardship and Spirit, with an emphasis on interfaith and intergenerational initiatives. This entry was posted in Greening, Jewish World, Lifelong Learning, Social Action/Tikkun Olam on December 9, 2012 by slhoch. This entry was posted in Greening, Jewish World, Lifelong Learning, Social Action/Tikkun Olam, Temple Life: General on December 9, 2012 by slhoch. Hurricane Sandy slammed into the East Coast of the United States, doing billions of dollars in damage, causing dozens of deaths, and leaving more than 7.5 million people without power. As the storm was downgraded to a low pressure system, it continued to wreak havoc as far west as Cleveland, Ohio, and as far north as Toronto, Ontario. Even as we work to determine the specific impact to URJ congregations and families, and to our larger communities, it is already clear – too clear – that this storm will require a long-term, coordinated recovery effort. The URJ is in the process of reaching out to all our congregations on the east coast and throughout the Midwest to determine what the most immediate needs are in impacted communities. 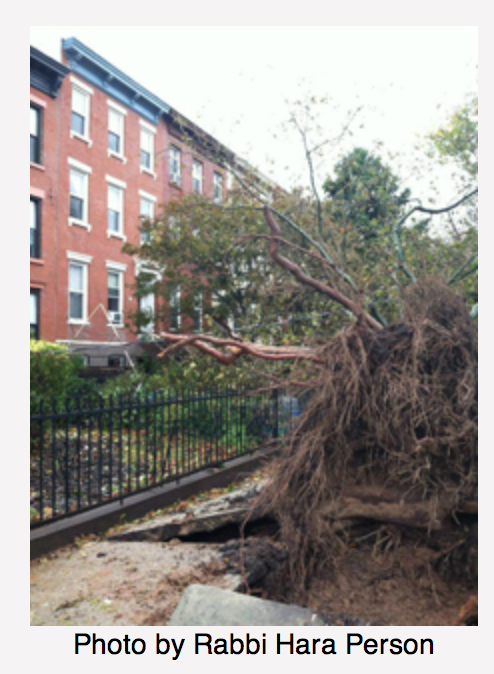 This entry was posted in Greening, Social Action/Tikkun Olam, Temple Life: General, Weekly Update on November 4, 2012 by danielmcohen. The work of tikkun olam does not just happen at home. When we travel, we can help build a more just, more sustainable world, rather than make travel choices that tread heavily on our environment and our fellow human beings. Learn more about the impact travel has on others and the world around us and help us all make more just travel choices. Next time you travel, we hope you will find ways to travel justly, as we are commanded: Justice, Justice, Shall You Pursue. You can start today by taking action to support carbon reductionand offsetting in your own community and in Israel by contributing to a clean future fueled by green jobs and sustainable products and practices. This entry was posted in Greening, Jewish World, Lifelong Learning, Social Action/Tikkun Olam on July 19, 2012 by slhoch. This year, Earth Hour, will be observed on Saturday, March 31 between 8:30 p.m. to 9:30 p.m. Hundreds of millions of people in thousands of cities and towns around the world are expected to turn off their lights in observation of the largest environmental event in history. More than 5,200 cities and towns in 135 countries worldwide participated in 2011, sending a powerful message for action on climate change. Co-chair of the West Orange Energy Commission Michael Brick led the call for state residents to switch their lights off on March 31. The Township of West Orange is a participating member in Earth Hour. The town’s mayor, Robert Parisi called for greater participation by residents and commended the Commission for its initiative in raising awareness of the global event. 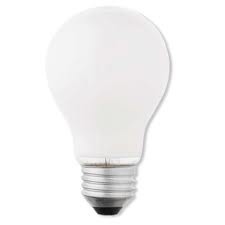 “This one symbolic act, of switching off one’s light for only 60 minutes, connects millions of people from around the world,” said Councilwoman Susan McCartney who also serves as the Energy Commission’s liaison to the Township. This entry was posted in Greening, Social Action/Tikkun Olam on March 30, 2012 by danielmcohen.